Foster + Partners has completely overhauled its plans for an Apple Store in Melbourne's Federation Square, but critics claim it has "simply swapped a Pizza Hut pagoda for an oversized iPad". Foster + Partners was made to revise the plans following a backlash against its original design, dubbed the Pizza Hut pagoda. Over 53,000 people signed a petition in protest, claiming that public space should not be compromised "for the sake of corporate business". Statements released by both Federation Square and the Victorian government claim the redesigned building will "create more than 500 square metres of new public space, provide outdoor shading, better connect the square to the Yarra River, deliver more cultural events and boost visitor numbers". "It's important that Fed Square continues to grow and evolve with the city," said Jonathan Tribe, Federation Square CEO. "The Apple global flagship store is consistent with, and contributes to, Federation Square's Civic and Cultural Charter, which recognises Melbourne's pre-eminence as a centre for creativity and innovation," he said. John Eren, Victoria's minister for tourism and major events, added: "This is more than just a store, it is a community activation space that will host arts, cultural, tech and music events complementing the original charter of Fed Square." Critics label new design "an oversized iPad"
It claims that Foster + Partners has "simply swapped a Pizza Hut pagoda for an oversized iPad". 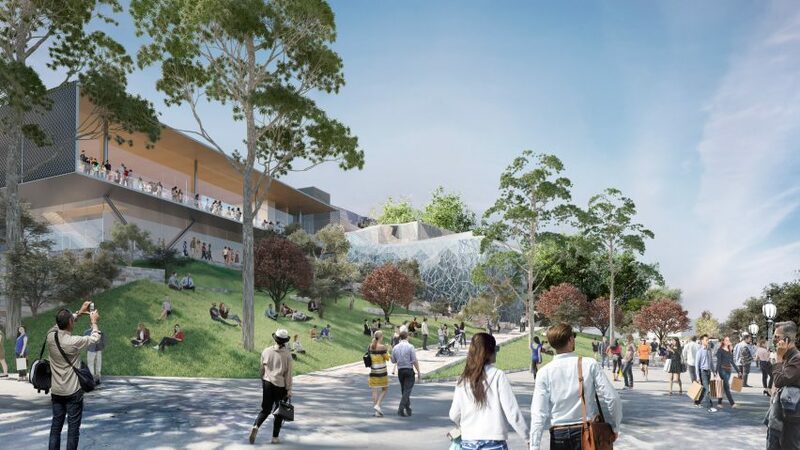 The proposal incorporates "more than 500 square metres of new public space"
"It doesn't matter how many times Apple redesigns its megastore, Federation Square is still the wrong place for an Apple Store," said Tania Davidge, president of Citizens for Melbourne. "Victorians would not support a giant iPad in the Botanic Gardens or at the National Gallery of Victoria. Why does the government think that Victorians would be happy to sell out what makes Melbourne great?" Davidge complained that the public weren't consulted in the redesign process, which has lasted over six months. "The redesign of the Apple store at Fed Square doesn't address the key problem with the proposal: the complete disregard for the Victorian people in shaping our public square," she stated. In a column for Dezeen, urban strategist Michelle Tabet argued that the new store may be the best way to to safeguard the civic character of the area.